The Eastern Black-crested Gibbon (Nomascus nasutus), also known as Cao Vit Gibbon, is a small ape named for the black fur on the crown of their heads. Over the past 45 years this species has experienced an 80% population decline, classifying it as a critically endangered, and the second most endangered primate in the globe. The Eastern Black-crested Gibbon was previously thought to be completely extinct, until in 2002 a small population was discovered in an isolated karst forest site in northeastern Vietnam, site of PRCF conservation work with the species. The only know population of Eastern Black-crested Gibbon is in a track of karst forest between northeastern Vietnam and southeastern China. Surveys from 2005 indicate there were an estimated 35-37 individuals living in Vietnam. In 2006, estimates showed there were only 10 individuals alive in China. Both populations have grown in recent years, likely due to conservation efforts initiated to protect primates and their habitat. Reports show that there are still less than 250 mature individuals remaining. Eastern Black Crested Gibbon are threatened by loss of their habitat from expansion of local agriculture, illegal use of forest resources, and illegal logging for firewood. PRCF has, since 2011, engaged habitat restoration measures in the landscape the Cao Vit Gibbon Species and Habitat Conservation Area. In collaboration with the protected area management board and local communities, our efforts include assisted natural regeneration, enrichment planting with native species, and phenological and vegetation natural regeneration studies. PRCF Vietnam has researched the extent of habitat loss and mapped degraded areas critical for gibbon expansion and long-term survival. 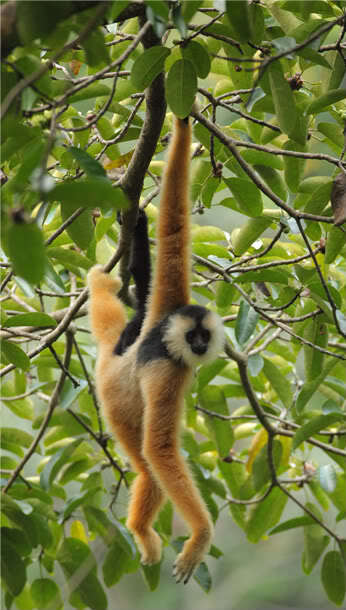 We restore the degraded forest areas by planting critical food sources for the gibbon. Together with community members, we are in process of restoring most degraded valleys with at least 25 different species to support the sustainability and growth of the gibbon population. We also work with the local communities to identify alternative land use options that are sustainable for community livelihood and reduce the threat of additional habitat loss to the gibbon. By engaging community members in conservation research, planning, and implementation, we support longevity of the Eastern Black Crested Gibbon and effectiveness of conservation efforts. Learn more about our Gibbon Habitat Restoration Program.